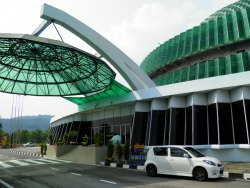 Kuala Lumpur's science museum, or National Science Centre to give it its official title, must have been a state-of-the-art attraction when it was first opened in 1996. Now, with the passage of time and our over-familiarity with the interactive style of modern museums, it is looking less impressive. However it is still worth visiting if you have a few hours to spare and children especially will find it fun and educational. 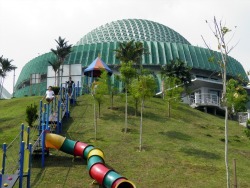 The science museum is located on 8 acres of manicured gardens at Bukit Kiara in north-west Kuala Lumpur. It is housed in a green glass building topped with a geodesic dome which is illuminated in various colours at night. The Centre contains over 1,000 interactive, hands-on exhibits arranged over 12 galleries which are designed to allow visitors to learn by experience. 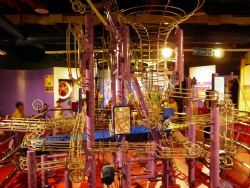 These exhibits take a heavy punishment as hordes of school children with limited attention spans and zero patience thump on the controls and immediately walk away if nothing spectacular happens in seconds. This type of treatment tends to mess up the machines resulting in a number of them being out-of-service. 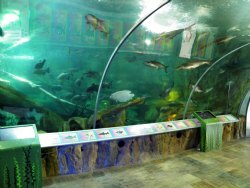 The main highlights include an aquarium (the sort where you walk through a tunnel so you are surrounded by gliding sting rays and other monster fish), a section on computers and telecoms (difficult to keep that type of display up-to-date), and some basic sciences programmes and activities. There is also an outside section with gardens, activity area, water plaza etc. It was a roasting hot day during our visit so we did not spend much time exploring this area and I am not sure if all the exhibits were open. 9am -5pm daily (last admission 4pm). Normally entrance costs RM6 for adults and RM3 for children (ages 6-12) but during our visit entrance was free because parts of the museum were under renovation. However we did have to pay for the temporary exhibition, Dinos Alive! 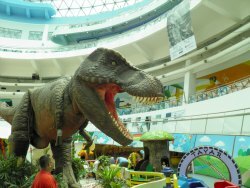 (a bunch of life-sized animatronic dinosaurs) which rans until 31 May 2011. There is a bus service - RapidKL bus no. U83 from KL Sentral but it seems to run at irregular hours and not at all at weekends. You might be better getting a taxi or driving yourself. See my location map below.